President Bush, spending his Fourth of July with American fighting forces, said U.S. troops will overcome persistent violence in Iraq and a rekindled insurgency in Afghanistan because the enemy is vulnerable. "On this day when we give thanks for our freedom, we also give thanks to the men and women who make our freedom possible," Bush told an estimated 3,500 U.S. troops at an outdoor speech Tuesday at Fort Bragg, home of the 82nd Airborne Division. "You are serving our country at a time when our country needs you. And because of your courage, every day is Independence Day in America," he said. Bush said that since the death of Abu Musab al-Zarqawi, al Qaeda's leader in Iraq, coalition and U.S. Iraqi forces have launched more than 190 raids on targets throughout the country, captured more than 700 enemy operatives and killed some 60 more. They have captured caches of weapons, and have received intelligence to help capture insurgents, he added. "At this moment of vulnerability for the enemy," he said, "we will continue to strike their network. We will disrupt their operations, and we will bring their leaders to justice." The outlook was less optimistic in Baghdad. Gunmen in camouflaged uniforms kidnapped Iraq's deputy electricity minister, Raed al-Hares, and 11 of his bodyguards in eastern Baghdad. The kidnapping occurred three days after gunmen seized a Sunni female legislator in east Baghdad; she and seven bodyguards are still missing. Tense conditions also exist currently in Afghanistan, where U.S.-led troops are facing fierce resistance from the Taliban in southern sections of the nation. 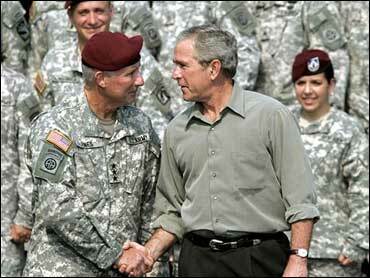 Bush paid special recognition to members of the U.S. military services who have died since the beginning of the Iraq war in March 2003. "I will make you this promise, I'm not going to allow the sacrifice of 2,527 troops who have died in Iraq to be in vain," Bush said to the crowd of uniformed troops, who responded with a chorus of "Hooah." Before he spoke, Bush was shown an array of military equipment, including a loudspeaker used by a psychological warfare operations unit, by members of the 82nd Airborne and Army special operations units. He shook their hands, squeezed their shoulders, patted them on the back. "Good job," he told a helicopter pilot who flew former Iraqi leader Saddam Hussein from the hole where he was captured to an airfield in Baghdad. The pilot, whose name was not provided for security reasons because he is being redeployed to Iraq, briefed the president on his unusual mission. Later, in a cafeteria at the base, Bush had lunch with military personnel, making himself a salad and grabbing a piece of fried chicken and some macaroni and cheese. While Bush was finishing his lunch, U.S. troops carried over a birthday cake decorated as a flag and began singing "Happy Birthday!" He blew out the candles on the cake, which also had 6-0 written on top, and exclaimed, "Give me a knife and I'll cut it! Anybody want a piece?" Bush's birthday is Thursday. Asked earlier if he planned to celebrate, Bush replied, "Generally, I celebrate my birthday on the birthday itself." Reminded of a party being planned for him back at the White House later Tuesday, he said, "There may be a surprise party." In his talk, the president did not mention any changes in troop levels, reiterating his refusal to set "an artificial timetable." Such a strategy would be "a terrible mistake," Bush said, adding that it would undermine the fledging Iraqi government. He also said it would undercut the morale of U.S. troops "by sending a message that the mission for which you risked your lives was not worth completing." Bush planned to watch the Fourth of July national fireworks display from the White House. Among the estimated 150 people who were expected were Bush friends Brad Freeman, Joe O'Neill, Mike Weiss and Charles Younger, who rode with him to Fort Bragg aboard Air Force One.